Today's reason to celebrate is in memory of Joe and Rosemary Peak. They are together again. And we are going to miss them. We are going to miss their smiles and their laughter. When we first moved to the Silver Valley our kids were little. It was always a treat to take the kids out to the Snake Pit for Sunday Brunch after church. We usually beat Rosemary there because she was playing the organ at church but we would leave just about the time Father Mel said "Mass is ended let us go in Peace to love and serve the Lord". Going to the Snake Pit for brunch was more like going to a relatives house. The food was homecooked and there was always jello. After breakfast Joe would stop by our table with a perfect sized scoop of huckleberry ice cream for the kids (big kids and little kids). 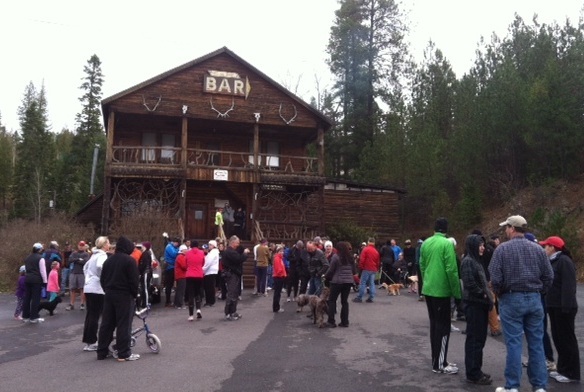 This past Thursday we celebrated the 35th annual Turkey Trot with Joe. He was there with his usual smile. Dogs, and their people, from all over the valley gathered to participate in this very non-competitive 5 mile run. It was good seeing Joe one last time. It's important who you choose to spend your time with. When you are around negative, mean people it is easy to get down too. But when you spend time with positive, hopeful, loving people then it is easy to share in their enthusiasm for life. Joe and Rosemary always exuded a calm, hopeful, peacefulness about them. They loved their family, their friends, and our community and it showed in every little smile. And I always felt more hopeful and happy whenever I had the to chance to spend time with them. We'll miss you Joe and Rosemary. My Huckleberry friends.